Lawn Mount Address Sign Holder - - designed for use with your own address plaque and 4x4 wood posts. Made in USA. 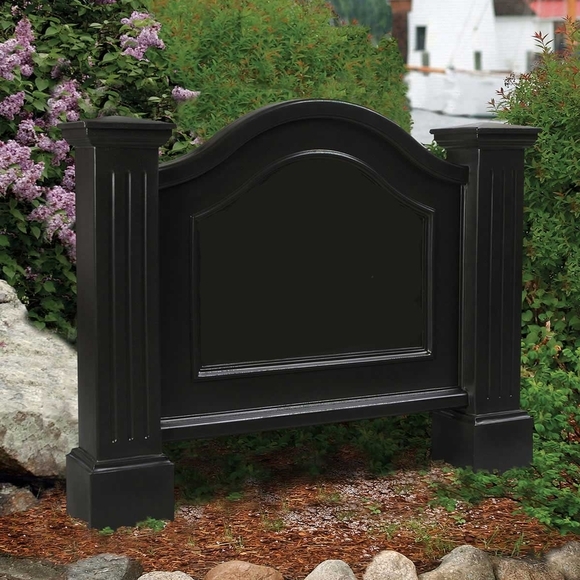 Arch shape inset panel area measures 20" wide x 11" high (15" high in the middle) and is designed to showcase your arch shape address sign (sold separately). Accommodates address plaques up to 20"W x 10.75"H (15"H in the middle). To purchase the personalized address plaque shown on the black and clay sign holders, click top link in Related Products. This sign comes in eleven popular color combinations including black plaque with gold characters, antique brass, antique copper, black plaque with silver characters, and dark green plaque with gold characters. The sign shown on the white sign holder is available in multiple colors. Click last items in Related Products for details. Note: address plaque and lawn mount holder ship separately. Made from high quality 100 percent polyethylene with built-in UV inhibitors for long lasting protection from the elements. System is rotationally molded using linear low density polyethylene (LLDPE). This material is virtually maintenance free, extremely durable, and will provide you with years of worry free enjoyment. Installs easily over standard 4×4 wood inserts (not included). Low-maintenance plastic won’t fade or yellow. The colorant is added throughout the material so the finish is consistent inside and out. No painting or staining required. Note: 4×4 wood posts, address plaque, and plaque mounting hardware are NOT included. Overall dimensions: 40"W x 6.75"D x 31.5"H; weighs 13 pounds. For best cleaning results, use a soap solution and high-pressure water. 15-year mfg. residential warranty. 5-year commercial warranty. Colors: black, clay, and white. If you are purchasing the optional sign, please allow 2 to 3 weeks for delivery. Lawn Mount Address Sign Holder designed for use with your own address plaque and posts. Ground mount address system installs easily over standard 4×4 wood inserts.